I am so pleased with the response this series. I am so glad everyone is enjoying it! 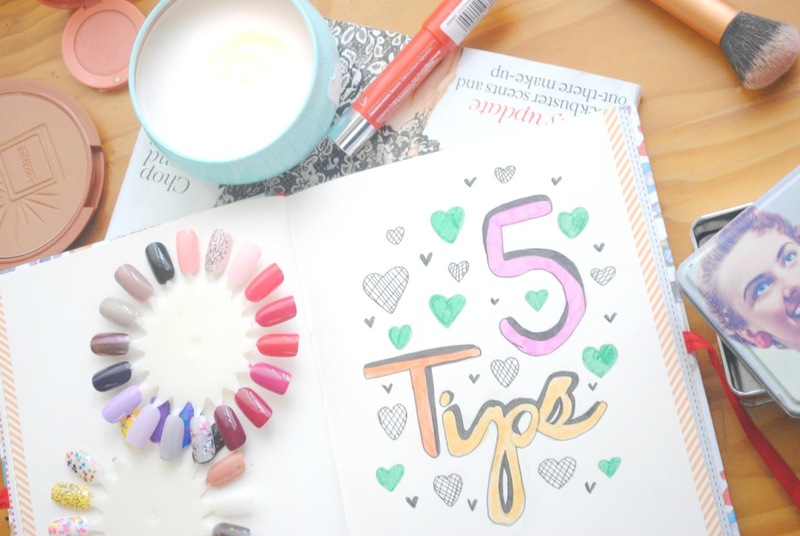 This time round the topic will be skincare , the five tips will be coming from Harriet who runs Blush and Bunting a new blog to my reading list but one I am thoroughly enjoying! 1. Try a double cleanse! This means cleansing once with a makeup remover (oil/balm/milk), and then cleansing your skin with a normal facial cleanser. I've never seen such a big improvement in my skin with just one change to my routine! 3. Exfoliating toners are better than scrubs. True, scrubs feel so satisfying and nice and they feel like they're doing a lot of good for your skin, but really it's just damaging it. Not only are exfoliating toners healthier, but they leave my skin feeling smoother than a scrub ever has! If you're not sure which toners are exfoliating have a look out for salicylic or glycolic acids in the ingredients list. 4. The best anti-ageing tip: Wear SPF, even in the Winter. The sun is incredibly damaging to your skin in terms of ageing and even if you don't go tanning a lot, just exposing yourself to the sun means your skin gets a little more damaged every day and the effects build up over time. This doesn't mean slapping on suncream everyday - find a moisturiser or foundation that already includes SPF! 5. Get to know ingredients! You don't have to memorise every ingredient the skincare industry uses, but look up some ingredients that would benefit your skin and then look out for products which have them. For example, rosehip oil for redness, vitamin A for ageing, glycerin for dry skin. Do you have any skincare tips ?